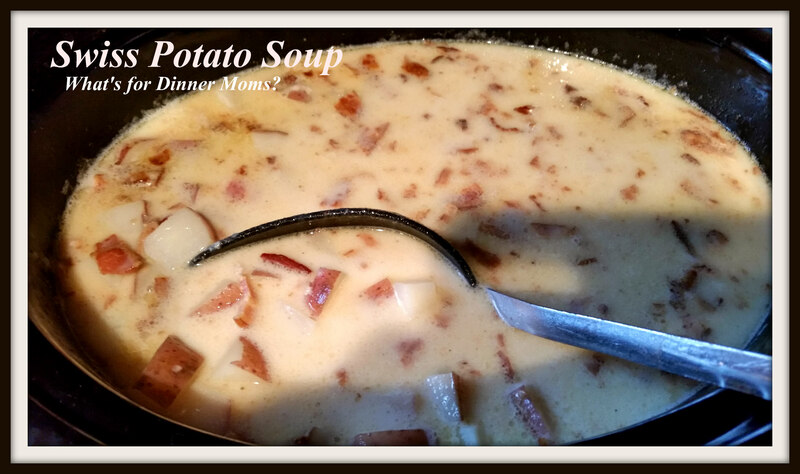 Swiss Potato Soup – What's for Dinner Moms? Yesterday I shared a recipe for Zopf bread (Swiss braided bread – click for link to recipe). When we make bread the first thing we want to make to go with it is soup! Hot fresh bread dipped in a creamy soup is pure heaven. So, we went with the Swiss theme and made Swiss Potato Soup. It has bacon. What more can I say. Swiss cheese, potatoes, bacon? My kids love the themed meals. The cheese is light so it is not heavy on the cheese flavor but the bacon adds a nice salty flavor. We served this with Zopf bread and add a green side salad for a complete meal. Once bacon is cooked to crisp remove bacon from frying pan and reserve 1 Tablespoon bacon grease. Saute onions over medium low heat to tender. Add chicken stock, potatoes and black pepper to pan. Bring to a boil and cook about 10 minutes until potatoes are fork tender. Mix together cream and flour until smooth. Slowly pour into the potato mixture. Allow it to return to a slow light boil. Cook until thickened 2-5 minutes. Remove pan from heat and add cheese and bacon. Stir until cheese is fully melted and incorporated. Taste and adjust spices as needed. Your soup and bread is what’s for supper tonight. Perfect soup for that beautiful bread! Will your family eat eggplant? Depends. Sometimes if I cut very thin and make eggplant parm they love it. In a casserole it’s iffy. Got a good recipe? Yes, it’s a stew with ground lamb. You can sub ground beef. The Picky husband likes it even with lamb. I bet you could use Turkey too. Yummy! Will have to give a place on the menu soon. Thank you! I wish my mom could speak English so i could show all these recipes to her. This websites makes me drool! Thank you. I think there may be a translate but I am not sure where it is. I may have to poke around to find it. I know I follow sites in German and French that it translates for me. No, you don’t understand. My mom is enemy of the Internet and its recipes. If there is an screen, it is TV screen. But show this site to my sister, she will definitely follow. That looks so good! And not difficult to make. I’m going to have to add this to my list of things I want to make.